24 Great Rail-Trails lists and describes in exacting detail the linear parks in New Jersey that were created from abandoned railroads. Each chapter tells how to get there, who to contact for local information, how long each trail is, and what kind of surface is encountered as well as allowed uses. There is additional information on local bike shops, the closest bed and breakfasts and a detailed odometer based mileage guide accurate to 1/10th of a mile. Route maps are up-to-date, computer generated USGS topographic maps and the book highlights over 150 miles of trails. The book also has a thumbnail sketch of each abandoned railroad’s history as well as antique maps, timetables and period advertisements. A short history of the Rails-to-Trails movement is included along with an extensive appendix, which lists hiking, biking, and equestrian clubs as well as sources for maps and further historical research. The author has worked in the railroad industry for twenty years. He serves as the New England field representative for the Rails-to-Trails Conservancy and has authored two other very successful books. He is one of western New England’s better-known railroad historians, and also a bicycling enthusiast. He owns a bed and breakfast in Northampton, MA located adjacent to the Northampton Bikeway rail-trail. New England Cartographics; ISBN: 1889787043 ; Dimensions (in inches): 6" x 9"
This is the first book to focus exclusively on Vermont's Green Mountain National Forest. This national forest, close to many metropolitan areas, offers excellent wilderness opportunities for hikers and backpackers. The many mountains, ponds, and other natural areas of the forest and nearby region are described in detail. Besides the usual trail descriptions and directions to the trailhead, the author has included many historical tidbits and reflections on personal experiences in the region. This book contains lively and accurate information on many features of the Green Mountain National Forest that have not previously appeared in other guidebooks, and also twenty-seven accurate topographical maps and many photographs. Backpackers and hikers will discover true wilderness close at hand. The Green Mountain National Forest is a treasure few know much about. This book guides one through the region's towns, including some great local eateries. Did you know there are 4 nationally declared wilderness areas in the southern Green Mountains? A second volume, covering the northern Green Mountain National Forest is in preparation. The maps in this book are excellent! 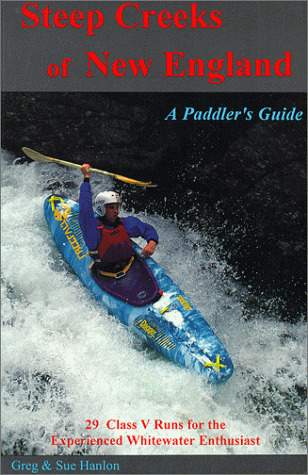 This book provides cutting-edge paddlers with a guide to 29 of the most extreme whitewater kayak runs in New England, while allowing armchair creekers a glimpse of the steepest stuff from the safety of their living rooms. The book is sure to become a classic among New England steep creekers. The intentionally brief descriptions, along with hard to find technical data on each river, make this guide ideal for class V boaters looking for their next challenge. Information on accessing real-time gage levels over the internet as well as accurate computer generated topographic maps and detailed directions to put-ins round out the book. The author works as a hydrologist for the U.S. Army Corps of Engineers and is an avid steep creek paddler. New England Cartographics; ISBN: 1889787051 ; Dimensions (in inches): 6" x 9"
The Trails Committee of the Berkshire Chapter, Appalachian Mountain Club announces the publication of the completely revised Metacomet-Monadnock Trail Guide, 10th edition. 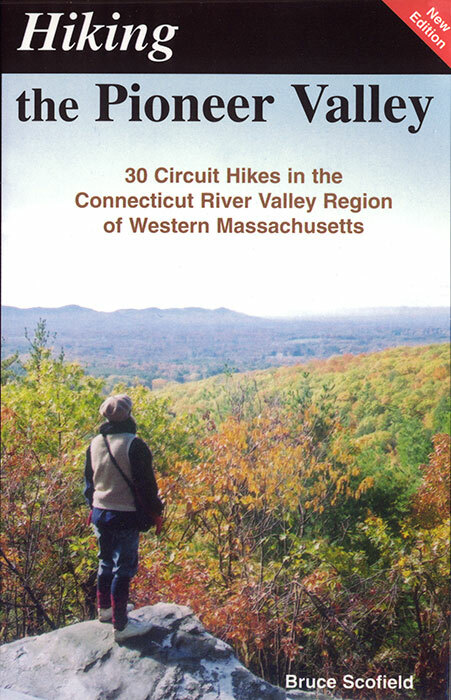 This popular guide describes a unique 117 mile footpath which traverses the Three County/Pioneer valley region of Western Massachusetts. The trail exists due to the cooperation of the many public and private property owners whose lands the trail crosses. About half of the trails length exists on public lands managed by MASS DEM, municipal water departments and town conservation commissions. Some of the more popular sections include: Mt. Tom Reservation, Holyoke Range/Skinner S.P., Cadwell Memorial Forest (U-Mass), Wendell S.F., Northfield/Erving/Warwick State Forests, and Mt. Grace State Forest, as well as several land trust properties. The Trail is maintained solely by volunteer effort under the auspices of the Berkshire Chapter, AMC. The Berkshire Chapter has 3,800 members residing in Western Mass. and is one of 12 chapters of the 95,000 member non-profit parent organization headquartered in Boston, Massachusetts. 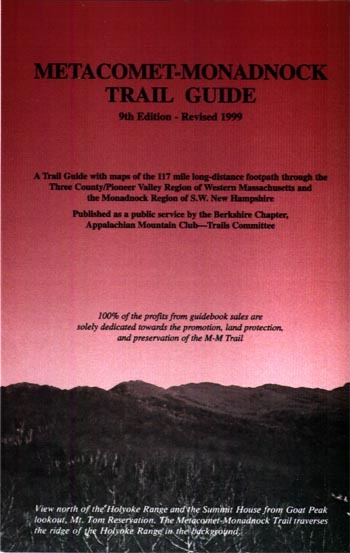 Proceeds from the sale of the guide are used to protect, promote, and maintain the trail. Golfing In New England is the ultimate resource anyone wi11 ever need to golf in New England. The book describes where golfers can play at all (over 600) of the public, semi-private, and resort courses in the six New England states. Each course description includes course statistics from the white, red, and blue tees (yardages, ratings, slopes, and pars), greens fees (weekend and weekdays), cart fees, directions to the course, telephone numbers, name of the golf pro, number of days of advance tee times, availability of driving ranges, credit cards, and the golfing season. Maps showing course locations and various indexes (best rated, easiest, least expensive courses, etc.) round out the course listings. The book also details all of the other golfing resources in each state such as golf retailers, driving ranges, golf schools, touring clubs, private golf courses, and golf associations. Besides being a comprehensive guide to golfing in New England, other sections of the book provide a wealth of interesting and fun golfing information. Included is information on how golf courses are designed, evolution of golf balls and clubs over time, how to calculate handicaps, golfing in the Olympics, how to build your own clubs, unusual golf courses, golfing records and feats, and collecting golf paraphernalia. Rounding out the book is a comprehensive listing of Internet golf locations, national golf associations, discount golf cards, museums, and magazines. The author is a golfing enthusiast living in North Tewksbury, Massachusetts and has played many of the courses in New England. New England Cartographics; ISBN: 1889787000 ; Dimensions (in inches): 8" x 10"
"High Peaks" lists and describes the 122 highest summits in the Northeastern United States. Each mountain's entry includes its location, the best maps available, its geological characteristics, the best trails to the the summit, and its local history. 51 photos and 48 reproduced USGS topographic maps with trail overlay give the reader additional visual information. The book also contains introductory text covering topics such as hiking and peakbagging, the geology of the Northeast and the proper use of this natural resource. A listing of the most important guidebooks, maps, hiking clubs and organizations comprises the appendix. Bruce Scofield is the author of numerous hiking books including one of the "50 Hikes" series of guides. New England Cartographics; ISBN: 0962480142 ; Dimensions (in inches): 8.5" x 5.5"
"Hiking the Pioneer Valley" describes 30 of the best areas to explore on foot in one of the most beautiful yet overlooked regions of Massachusetts; Franklin, Hampshire, and Hampden counties. Each hike has detailed maps and directions with accompanying photographs to give the hiker a better appreciation of the hidden beauty and natural resources available to residents and visitors to our region. The 30 hikes represent the best possible variety of scenery, challenge and terrain that the valley has to offer. A section on hiking with children will be invaluable to parents lacking knowledge of where to bring them along. Common sense advice on equipment, safety, and weather as well as a detailed list of area hiking organizations, land trusts and available maps round out the body of the text. The book was written by experienced local guidebook author Bruce Scofield. Bruce has written numerous other trail guides to the High Peaks regions of New York, New Jersey, and New England. New England Cartographics; ISBN: 1889787094 ; Dimensions (in inches): 6" x 9"
This comprehensive guide is authored by long-time Valley resident Marion Gorham, an accomplished bicyclist with, extensive experience in touring throughout Europe and North America. Gorham is also the newsletter-editor of the Franklin-Hampshire Freewheelers Bicycle Club. The 28 tours listed in this guide offer many choices for both the novice and the experienced cyclist – a variety of terrain and outstanding features of the region, from scenic mountains and farmland vistas to waterfalls, country stores, rail-trails, and lightly-used backcountry roads. Rides include detailed descriptions and options to lengthen or shorten the routes, making for 75 different tour options with distances ranging from 15-mile half-day rides to a 60-mile circuit around the Quabbin Reservoir. Each tour is accompanied by a detailed, computer-compiled map showing the main route plus options in an accurate, easy-to-read format. Bicycling the Pioneer Valley also contains practical sections on safety, equipment and riding technique, as well as useful lists of national and local touring clubs, recommended books and maps, and a complete directory of the area bicycle shops. New England Cartographics; ISBN: 1889787027 ; Dimensions (in inches): 7.25" x 4.75"
Skiing the Pioneer Valley is the only currently available guide to the many skiing opportunities in the wider Pioneer Valley region of Western Massachusetts. It is written for skiers of all abilities, from beginner to advanced, and it provides a variety of experiences – for those who wish to ski for an hour, or those who love to climb mountains on their skiis on more challenging all-day tours. This guide offers the reader almost anything they would want to know about skiing in the Franklin, Hampshire, and Hampden county region. New England Cartographics; ISBN: 1889787019 ; Dimensions (in inches): 7.25" x 4.75"
"Hiking The Monadnock Region" describes in exacting detail Thirty of the best nature walks and day hikes in New Hampshire's Currier and Ives region. Each chapter contains an easy to follow map, lowest and highest elevations, levels of difficulty, clear trail directions, photographs and an overview of the special features of the walk. Nearly a dozen of the outings are appearing in print for the first time. Many of the hikes are ideal for families with children and there are challenging routes with the more experienced hiker in mind. Additional information on visiting old cemeteries, waterfalls and natural and historical points of interest provide a full itinerary to round out the hiker's day. An extensive appendix lists local hiking and nonprofit conservation and recreation organizations as well as sources for maps. New England Cartographics; ISBN: 1-889787-07-8; Dimensions (in inches): 7.25" x 4.75"
North of Quabbin Revisited by Allen Young of Royalston is completely revised with 484 pages, 10 maps, an extensive index, and more than 200 photographs. North of Quabbin Revisited is a guide to nine Massachusetts towns north of Quabbin Reservoir: Athol, Erving, New Salem, Orange, Petersham, Phillipston, Royalston, Warwick, and Wendell. The book is all new, inspired by Young's 1983 North of Quabbin, published by Millers River Publishing Company. North of Quabbin Revisited has a foreword by Christina Tree, travel writer for the Boston Globe and author of Massachusetts: An Explorer's Guide. "North of Quabbin Revisited works as a travel guide," writes Tree, "but what it really is about is the people of North Quabbin, its industry and arts, its legends and very fabric." Young's particular interests are in land preservation and natural resources, and they are covered extensively in North of Quabbin Revisited, but the book also offers detailed discussions of arts, theater, sports, music, recreation, food, restaurants, shopping, health care, history, and neighboring communities according to alphabetical topic listings. Each of the nine North of Quabbin towns receives a special multi-paged entry with a map that highlights points of interest. At the end of each entry is a "See also" section for related articles. A detailed index lists the names of area people, places, businesses, and attractions with page references. Guidebook text and photographs by Joseph Bushee Jr.
Waterfalls of Massachusetts features 55 great locations for viewing waterfalls: all of them chosen for their beauty and easy accessibility. Each waterfall site described here includes driving directions, detailed map, trail notes, and an attractive photograph. The waterfalls are arranged by region -- the Berkshires, Connecticut River Valley, central Massachusetts, and the Boston metro area. Within each region, they are arranged in groups near to each other so that the reader can more easily plan to visit several waterfalls during one trip. Also included in this useful guide is advice on hiking safety, equipment, and photography, along with geologic and historical information that provides the background necessary for a better appreciation of these natural scenic wonders. In addition, there is a detailed list of hiking organizations, land trusts, and sources for maps. In commemoration of our 20th anniversary, Mount Grace Land Conservation Trust has compiled twenty hikes (actually nineteen hikes and one canoe trip) that highlight some of the projects we have worked on which are best suited to hiking or visiting. Selected from more than two hundred land protection projects Mount Grace Land Conservation Trust has assisted with over the years, each of the trails crosses a portion of the extensive mosaic of protected land that characterizes the local landscape of the greater North Quabbin region.